Spiiderweb™: US Coup Planned for Venezuela? If so, I must be a writer. US Coup Planned for Venezuela? The only thing surprising here is how long it took. Hugo Chávez has been in Washington's sights ever since he was elected. It will be interesting to see if the proposed coup d'etat actually materializes now that the world knows about it. Clandestine operations are hardly clandestine when under the klieg lights. The New York Times had a news article about Venezuela in Thursday’s edition, but it was about Venezuelan President Hugo Chavez saying he would cut diplomatic ties with neighboring Colombia. There wasn’t a word about a memo from a CIA operative in Caracas to CIA Director General Michael Hayden, uncovered yesterday, outlining a plan for interfering with a Venezuelan referendum set for Dec. 2, and laying out the steps for instigating and backing a coup. The plot, called “Operation Pliers,” and laid out in the letter to Hayden by an undercover operative named Michael Steele, who reportedly works in the US Embassy as a “regional affairs officer,” was intercepted by Venezuelan intelligence and released publicly on state TV yesterday. * Working through the US military attaché at the embassy to coordinate with ex-military officers and former coup plotters against Chavez. Even more darkly, the letter calls for initiating “military actions” to support opposition mobilizations and strategic building occupations, involving US military bases in neighboring Curacao and Colombia to provide support, and even taking control of parts of Venezuela in the days after the referendum, while encouraging a “military rebellion” inside the Venezuelan National Guard. Much is covered by the above story, but there are some new twists. On November 26, 2007 the Venezuelan government broadcast and circulated a confidential memo from the US embassy to the CIA which is devastatingly revealing of US clandestine operations and which will influence the referendum this Sunday, December 2, 2007. The memo sent by an embassy official, Michael Middleton Steere, was addressed to the Director of Central Intelligence, Michael Hayden. The memo was entitled 'Advancing to the Last Phase of Operation Pincer' and updates the activity by a CIA unit with the acronym 'HUMINT' (Human Intelligence) which is engaged in clandestine action to destabilize the forth-coming referendum and coordinate the civil military overthrow of the elected Chavez government. The Embassy-CIA's polls concede that 57 per cent of the voters approved of the constitutional amendments proposed by Chavez but also predicted a 60 per cent abstention. The US operatives emphasized their capacity to recruit former Chavez supporters among the social democrats (PODEMOS) and the former Minister of Defense Baduel, claiming to have reduced the 'yes' vote by 6 per cent from its original margin. Nevertheless the Embassy operatives concede that they have reached their ceiling, recognizing they cannot defeat the amendments via the electoral route. The memo then recommends that Operation Pincer (OP) [Operación Tenaza] be operationalized. OP involves a two-pronged strategy of impeding the referendum, rejecting the outcome at the same time as calling for a 'no' vote. The run up to the referendum includes running phony polls, attacking electoral officials and running propaganda through the private media accusing the government of fraud and calling for a 'no' vote. Contradictions, the report emphasizes, are of no matter. 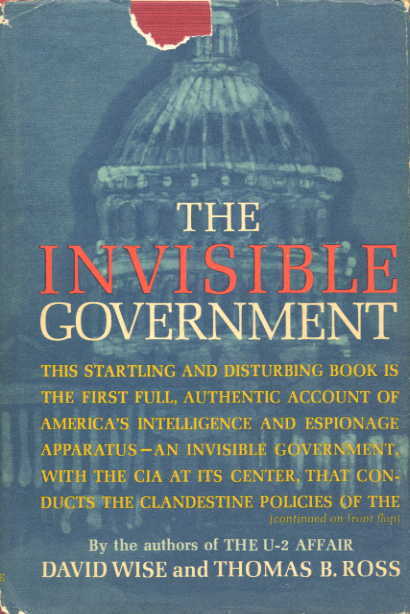 If you haven't, you might want to read The Invisible Government (Amazon) by David Wise and Thomas B. Ross. 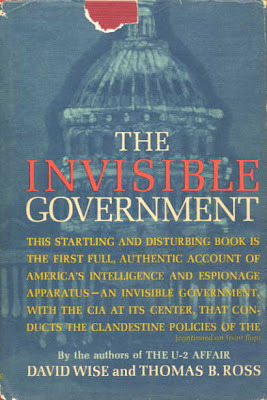 This startling and disturbing book is the first full, authentic account of America's intelligence and espionage apparatus, an invisible government, with the CIA at its center, that conducts the clandestine policies of the United States in the cold war. Many of the revelations about abuses and secret unaccountability were things that Americans had not been aware of until this book was released. Its actually pretty tame stuff compared to what the idiot has done and is doing as I type. According to Amazon, no fewer than 85 books written since reference this work. Spent many years programming, mostly mainframes. Been in business for myself, sky dived, scuba dived, practiced karate (until the broken ribs & finger), driven a sprint car (unreal). Want the US to be great again and worry it's impossible. I consider myself a moderate because I believe most Americans don't approve of torture, do want everyone to have health care, a pension and/or a job, privacy, freedom and NO WAR. Not too radical. I use profanity like a sailor so you should leave if you are sensitive. Iraqi Contractors Frozen Out of U.S.